When I was in 7th grade, I went in to make a layup while playing on my middle school basketball team. As I began to jump, I felt something give in my back. I immediately fell to the ground with excruciating pain. I had injured my lower back. I spent most of the next week hunched over because the pain was so bad. I tried pain relievers, ice, and heat without much relief. My parents even had me meet with a personal trainer who recommended that I use a hot tub. The pain lasted over a month. While my pain diminished, my back still felt weak and unstable. I was unable to enjoy playing basketball for several weeks while my condition healed slowly. If someone had only recommended that I see a chiropractor, I’m sure my condition would have gotten better faster. I also believe that I wouldn’t have the occasional back problems that I still have today. If only I had known! While I was a senior biology major at Viterbo University, I heard a local chiropractor speak. I had known for quite a while that I wanted to be involved in healthcare, helping people get well and stay well. What the chiropractor said about health, that health comes from within, and that drugs and surgery should be used as a last resort struck a cord with me. I had always believed that health should be a natural process as much as possible. I observed this chiropractor in action, and witnessed first hand the great results. I knew I had found my calling. Children of Nepal show their traditional festive costumes. Chiropractic is safe and effective for kids, too! I applied and was accepted into the chiropractic program at Palmer College of Chiropractic in Davenport, Iowa following my graduation from Viterbo in 1997. I chose to attend Palmer because of it’s rich history within the profession. Palmer is the founding school of chiropractic in the country and has a sterling reputation. Many people that call our office will specifically ask whether I am a Palmer graduate. The reason this is important to them is that people have come to expect an exceptional level of chiropractic care from Palmer graduates. 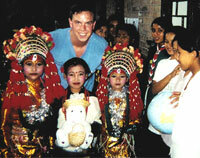 While at Palmer I was selected to go on a clinic abroad trip to Nepal in the summer of 2000. This was truly a life changing experience for me. In Nepal (between China and India), I gained a new perspective on life. I learned that material things may come and go, but having health, family, and faith are invaluable. I was able to give free chiropractic care to well over 100 people during my nearly 3 weeks in this third-world country. Dr. Wood performs an adjustment on the lower back of a woman in Nepal. The woman had been stooped forward transplanting rice by hand for 10 hours that day. Ouch! While at Palmer College I also had an opportunity to be a high school basketball coach at Davenport Central High School. This 3 year coaching position enhanced my ability to be an effective communicator and leader. This has helped me professionally as a chiropractor because many of the patients that visit our office are in need of a health coach. By listening to the needs of people on an individual basis, proper recommendations can be made, and health goals can be achieved. Upon graduation from Palmer College in 2001, I decided to come back to the coulee region to practice. In my 14 years as a chiropractor, I have witnessed more success stories than I can remember. Most people come in to our office for a specific complaint. As their care at our office continues, many people remark that not only did their initial complaint get better, but things they didn’t even come in for got better too. This speaks to the power of chiropractic and the body’s own ability to heal itself when given the chance. It has always been my philosophy that any recommendation I make to a patient would be the same recommendation that I would make to a member of my own family! You can trust that I will be as honest and up-front with you as possible. I had a great childhood growing up in La Crosse. This played a large part in my decision to return to the area to open up a practice. I had always wanted to give back to the community that had given me so much when I was younger. I have been active in several service and advisory groups including La Crescent Rotary, La Crosse Jaycees, and the Viterbo Alumni Board. I have also been a member of business and professional organizations including Business Network International, the Minnesota Chiropractic Association, and the Wisconsin Chiropractic Association. I have offered meetings at my office for pre-chiropractic students at both UW-L and Viterbo to encourage their continued interest in the profession. Dr. Wood and other chiropractors are formally thanked for their efforts by Crown Prince Dipendra of Nepal. My wife Susan and I met at Viterbo while she was a nursing student. She is currently employed locally as an oncology (cancer) clinic nurse. We currently live in La Crescent, not too far from either of our families. We have been blessed with two children and enjoy being parents and watching them grow. When not working to improve the health of others, I enjoy working out regularly. I still see a chiropractor for regular adjustmentsto maintain a healthy nervous system and to optimize the function of my body. I’ve found that since beginning chiropractic care in college, I have not missed a day of work due to a cold or flu in over 14 years! What that means is I walk the talk. Health recommendations from me are more than lip service. I am passionate about my own health which allows me to be a better health coach to others. 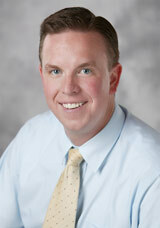 Call Chiropractic First of La Crescent Today! Thanks for visiting our site. I look forward to meeting you in person and learning how we may be of service to you. Call our La Crescent chiropractic office to get started with chiropractic care today!